“The Book of Mormon” returns to North Texas for back-to-back, limited engagements in Fort Worth and Dallas. Opening Jan. 22 at Bass Performance Hall, the show is presented by Performing Arts Fort Worth through Jan. 27. The award-winning musical opens at the Music Hall at Fair Park, presented by Dallas Summer Musicals and Broadway Across America, Jan. 29-Feb. 3. Tickets for the Fort Worth engagement start at $44, available at basshall.com. For group sales, call 817-2124248. Single tickets for the Dallas engagement start at $29 (pricing subject to change), available at DallasSummerMusicals.org. They can also be purchased in person at the Music Hall at Fair Park Box Office Monday through Friday from 10 a.m. to 6 p.m. and Saturday from 10 a.m. to 4 p.m. Orders for groups of ten (10) or more may be placed by calling (214) 426-4768. “The Book of Mormon” features book, music and lyrics by Trey Parker, Robert Lopez and Matt Stone. Parker and Stone are the four-time Emmy Award-winning creators of animated series, “South Park.” Tony Award-winner Lopez is co-creator of the long-running hit musical comedy, Avenue Q. The musical is choreographed by Tony Award-winner Casey Nicholaw and is directed by Nicholaw and Parker. With set design by Scott Pask, costume design by Ann Roth, lighting design by Brian MacDevitt and sound design by Brian Ronan, the musical features orchestrations by Larry Hochman and Stephen Oremus. Music direction and vocal arrangements are by Stephen Oremus. The musical won nine Tony Awards, including Best Musical, Best Score, Best Book, Best Direction, Best Featured Actress (Nikki M. James), Best Scenic Design (Scott Pask), Best Lighting Design (Brian MacDevitt), Best Sound Design (Brian Ronan) and Best Orchestrations (Larry Hochman, Stephen Oremus). 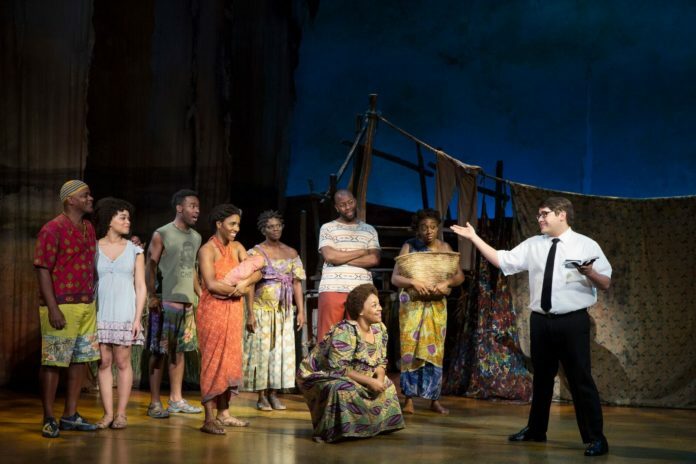 The Original Broadway Cast Recording for “The Book of Mormon,” winner of the 2011 Grammy Award for Best Musical Theater Album, is available on Ghostlight Records. For more information, visit BookofMormonTheMusical.com. Lottery tickets are available for every city on the national tour. Lottery drawings will be Jan. 29-Feb. 3 at the Music Hall at Fair Park in Dallas. The production will conduct a pre-show lottery at the box office, offering a limited number of tickets for $25 each. Entries will be accepted at the box office beginning two and a half hours prior to each performance. Each person will print their name and the number of tickets (1 or 2) they wish to purchase on a card that is provided. Two hours before curtain, names will be drawn at random for a limited number of tickets priced at $25 each. Only one entry is allowed per person. Cards are checked for duplication and winner must be present at the time of drawing. For more information about the lottery for “The Book of Mormon” tickets at the Music Hall, please visit dallassummermusicals.org. Freelance automobile, entertainment and travel writer for Focus Daily News.